As this is supposed to be a merry season, I am not going to address any serious issue today, however, tomorrow I might post what is on my mind! 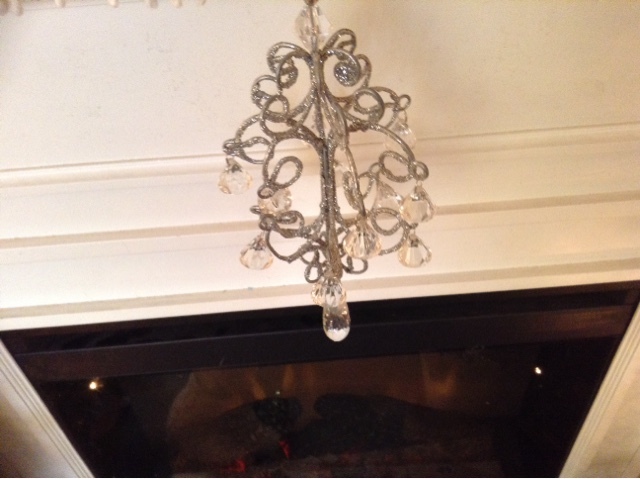 This year, like last year, I am not putting ornaments on those pesky little hooks. I will use any ornament called a pick or a clip, that is easier to remove, but for now, I have ornaments in a container, as you see below. Goodwill received a shipment of boxes containing porcelain dolls. Inside the box, the cardboard support around the heads and arms was still unmoved, and the tissue papers and certificates were still there. When I went back, they were all removed from the charming boxes and set up with all the used dolls. I remembered this one in the box. I think it reduces the value when the box is gone, but who can keep empty boxes around unless they have an attic. However as an added bonus, in the box, they cost $29 and on the shelf minus the box, the price was $7.99. We have discount coupons here for donations, so I used mine and got it for less. I thought this doll went well with my decor, and I have missed having dolls and toys laying around the house. It is good to have a stash of toys around, so I'm trying to replace some Lego, some trucks, as well as other things, for visiting children. You might see some here in future posts. I have taken 4 yards of plaid fleece and cut it into lengths to use as little blankets throughout the house to give some color and comfort, and yes, people do use them when they come, on their laps or as shawls. I plan to use some as tablecloths, too. I have more pictures, which I will post throughout the week. Decor is not for making an impression but to create comfort for others, and to feed my senses with good, lovely and delightful reminders of beauty and God's wonderful blessings. Sometimes I will get a comment or an email from someone accusing me of having a blog "that is all about YOU." I know other bloggers that have received the same cutting remarks. It is designed by old cranks who want to unsettle you by shifting your focus away from your home and your interests. In case there are some new viewers who are influenced by negative remarks like this, a blog is similar to keeping a log, list, diary etc. Iblog is short for web-log. If someone has a web log, you rather expect it to be an update of what they are doing at home, in business, or other interests. At this current time in history, it's rather ignorant to be making the accusation, " It's all about you," because that is generally what it is. Do you expect me to write about someone else's personal interest? That would be very much like walking on eggshells, because of copyright and gossip, and all that. Love your blog. Blessings Gail. Dawn, can you please publish again? I was using such a small device that I deleted it! Your new doll is very pretty and is a nice touch to your parlor. Your pictures show a place with a nice balance of cozy and light-and-airy. People can be ridiculous. Complaining about how your blog is too much about you? Haha. They're just trying very hard to find something to complain about I guess. In case I don't comment again for a while, Merry Christmas and Happy New Year to you and your family, Lady Lydia. With all the upheaval in our family right now I don't know if I'll even get a tree up. The doll is adorable and I love the plaid. It's very festive. The little basket of glass pinecones is festive as well. you've done it again. Not letting anyone spoil your peace and joy! Bravo! There will always be nay sayers. It seems to me I read in the book of Psalms or was it Proverbs that there are some people can't sleep unless they have caused others trouble. I also remember that old saying that "misery loves company". The Bible says for us to pray for people like that. It seems its always around the holidays when grumblers come out of the woodwork. Your decor looks like the high end decor I've been seeing in several decorating magazines lately. Very peaceful and serene. So inviting. You inspire me. I think I shall bring a few toys down from the attic to decorate with also then my gr. granddaughters can play with them. By the way I adore the plaid fleece used here and there. Also the bowl of shiny ornaments. Really classy! One summer at a yard sale I found some of those chandelier crystals for a $1 ea. I bought all 5 of them and hung them on the Christmas tree. When the sun shines through the window on them the whole room is lit up like a rainbow. Its delightful. Merry Christmas and have a cup of hot mulled cider! Your home looks beautiful and very welcoming! It is festive without being overwhelming. 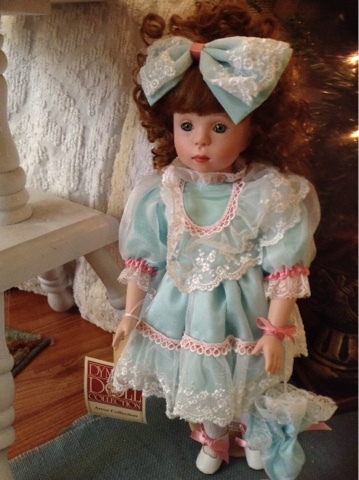 The basket of blue ornaments is a perfect match for the doll's dress. It seems like people are taking pleasure these days in being negative and letting their anger and misery flow out of them. What a sad way to live. Hope you have a wonderful Christmas! Love your plaid fleece little blankets...I have an old wool plaid blanket from childhood I use over my legs while in the car..it is so cold here now...my neighbor liked the idea so much and I have decided to buy some plaid fleece and make one for her for Christmas. Thanks, Lydia, for yet another great idea! Merry Christmas and Stan and the rest of your family! 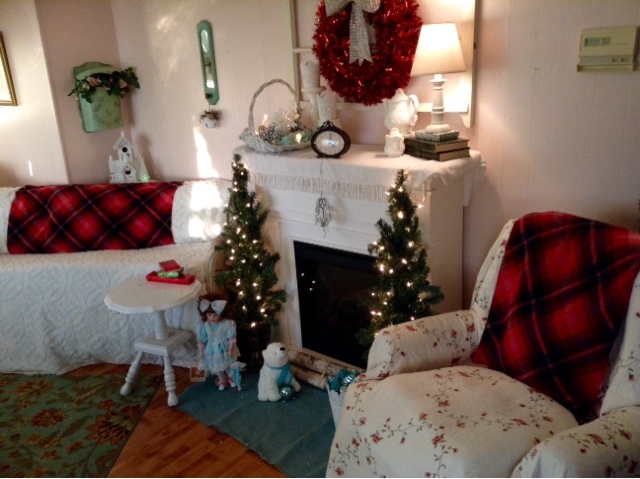 What a pretty and cozy home you have - your Christmas decorations and ideas are beautiful. Have a Merry Christmas! Mary S.
ME GUSTA SU DECORACION QUERIDA, AUNQUE NOSOTROS NO FESTEJAMOS NAVIDAD, LA DECORACION DE INVIERNO ES MUY AGRADABLE, LAS MANTAS SOBRE LOS SILLONES, LA CHIMENEA ARDIENDO, Y ESA MUÑECA, ADORO LAS MUÑECAS ANTIGUAS, CUANDO MIS HIJAS ERAN PEQUEÑAS, LES HACIA MUÑECAS DE TELA, CON LINDOS VESTIDOS, QUE HERMOSAS, LA DECORACION CON ELEMENTOS ANTIGUOS ES MI FAVORITA. QUE EL SEÑOR LES DE PAZ, AMOR Y ABUNDANTE GRACIA PARA EL 2018. BENDICIONES DESDE ARGENTINA. Lydia, your home looks beautiful and I love your wisdom and how you share it on YOUR blog, which is all about YOU and your thoughts and opinions. As it should be. Please keep doing what you do to encourage us. So beautiful! Thank you for sharing these photos of your lovely decorations. I love the plaid fleece. A while ago someone gave me some lengths of fleece from the fabric store, and I use them as blankets, too. They are much thicker and of better quality than the fleece "blankets" you find at Walmart which are often very thin and not warm at all. I like your decorations DEAR, although we do not celebrate Christmas, Winter Decoration IS VERY NICE, the blankets on the armchairs and the fireplace, burning, and that doll, I LOVE THE antique dolls, when my children were small, I made rag dolls, with nice clothes, that beautiful, the decor with antique ELEMENTS IS MY FAVORITE. May the LORD GIVE YOU PEACE, LOVE AND ABUNDANT GRACE FOR THE 2018. Blessings FROM ARGENTINA.. I found it quite funny that someone would say that YOUR blog was all about YOU in a negative manner. That is the reason I read the blogs that I read. 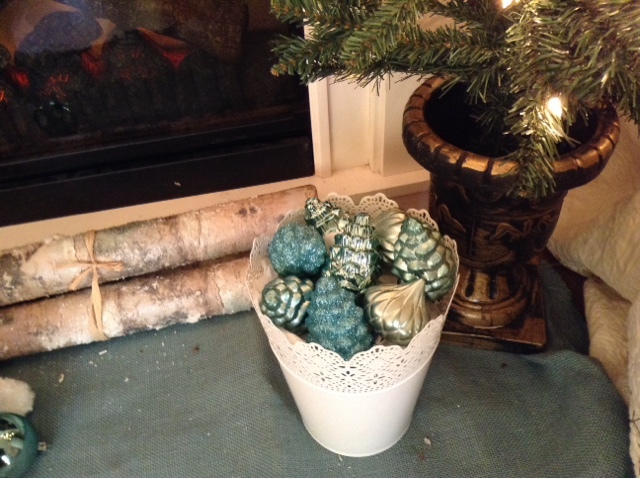 To see what other people are doing to create beauty in their homes while being thrifty and frugal. I have, over the years, found a few blogs that, at first, appeared to be what I wanted to read but I later found out that it wasn't. Instead of leaving negative comments and rants, I simply clicked the "unfollow" button. Just because it didn't appeal to me doesn't mean that I should give them "a piece of my mind" and advice on what they should be writing about. I just sit here shaking my head at the audacity of some people. With that, I bid all of you a safe and happy holiday season and a blessed New Year. Lydia, I have enjoyed your blog for years. Your decorating ideas and skills are a pleasure to behold. Recently I was reading a detective novel in which the phrase “having discovered the pleasures of domestic life” was used to describe a woman who was happy at home. I immediately thought of this blog! I am particularly fond of your championing dresses. Every time I am out and see yet another young legging-clad woman bending over her little child I want to snap a picture of that rear view and show it to her! I never thought anything could be worse than the tight stretchy jeans but the leggings truly are. A friend told me that I just don’t appreciate how cheap AND comfortable those leggings are. I do know but oh my. Thank you for sharing your decorating pictures. I have adopted a simpler way of decorating and sometimes fear I get too simple. 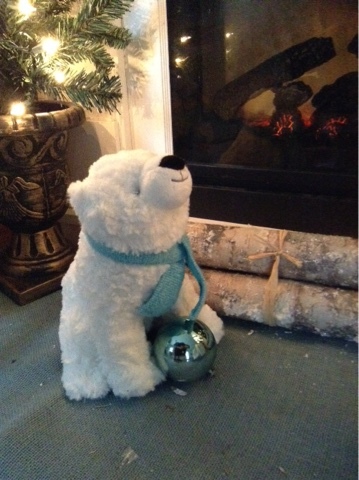 Your ideas of a basket of balls, or my favorite - the bear with an ornament - is such a refreshing way to look at decorating. Thank you so much.